An easy, and delicious Gluten-Free Cheesy Spinach & Bell Pepper Strata! This makes a perfect breakfast or brunch any time of year! My little one loves egg dishes, and I had some leftover bread that needed using. What resulted from this combo is a hearty & savory dish that packs a flavorful protein punch, and isn't too shabby to look at either! 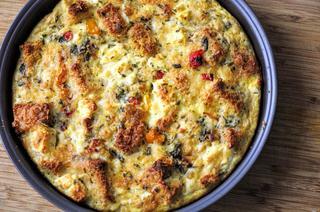 An easy and delicious Gluten-Free Cheesy Spinach and Bell Pepper Strata. It makes for a great healthy gluten free breakfast casserole dish! Preheat oven to 375°F. Grease a casserole dish (I used a 9 inch round dish).Heat 1 1/2 tbs butter in skillet over medium heat.Add bell pepper & saute until tender (about 5 mins), add minced garlic & spinach & saute just one minute longer. Remove from heat.Melt 1 1/2 tbs butter & drizzle over bread cubes.Layer half of the bread cubes, followed by half of bell the pepper-garlic-spinach mixture, then half of the parmesan & feta. Repeat with remaining half of ingredients.Beat eggs, milk, mustard, salt & pepper together. Pour over strata.Sprinkle 1 tbs Parmesan & 1/2 tbs of dried parsley on top. Dab remaining 1 tbs butter on top.You can let sit in fridge overnight before baking, or bake right away. Bake at 375°F for 45 mins or until firm, puffed and golden brown.Enjoy.